L.A. Kings center Jeff Carter, left, shoots past Chicago Blackhawks defenseman Johnny Oduya during the second period of the Kings’ Game 4 win in the Western Conference finals Monday night in Los Angeles. 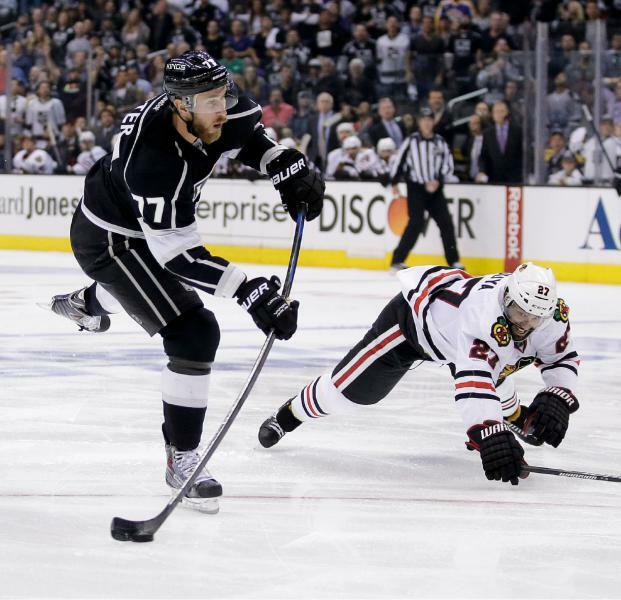 Home ice advantage served the Los Angeles Kings yet again and so has the Chicago Blackhawks’ continued uneven play, which has allowed L.A. to taking care of business in the last three games of the Western Conference Finals. Monday night saw the third game in that stretch, a 5-2 win in Game 4, or in the Hawks’ collective minds’, a 5-2 loss in Game 4, putting them in a devastating 3-1 series deficit. Before the game, coach Joel Quenneville changed his lines, including pairing up Jonathan Toews, Patrick Kane and Bryan Bickell on the top line and inserting Peter Regin on the 4th line in place of Brandon Bollig. The Hawks had a good start to the game but the maneuvering did nothing to bring about more goals. Even after creating two power play opportunities early on, the Hawks were shut out, but things began to spiral when Marian Hossa was called for goalie interference midway through the first period. The Kings turned that mistake to a power play goal from defenseman Jake Muzzin at the nine minute mark, giving the home team an early 1-0 advantage. Later in the period, Marian Gaborik chipped in with his 10th goal of the playoffs (11:13) off a tip-in and a turnover by Hawks defenseman Duncan Keith to give the Kings a 2-0 lead. Chicago was not done with the dumb penalties either, and that helped provide a 3-0 lead for L.A. prior to the end of the first period as Patrick Sharp was called for roughing on Jarret Stoll (15:04) which led to another power play goal from Kings captain Dustin Brown (15:56). More of the same came in the second period as star defenseman Drew Doughty of the Kings tallied home his third goal of the playoffs and second of the series off a wrist shot, extending their lead to 4-0. The Hawks made a push toward the end of the period and got something to get excited about when Brandon Saad delivered off a backhand shot (14:03) in front of the net and cut the lead down to 4-1. Chicago continued its offensive push into the third but the Kings were stingy defensively, still they couldn’t hold off Bryan Bickell who got his first goal of this series just over nine minutes in. The Hawks were within two goals of the Kings but wouldn’t get any closer. The Kings held serve and concluded matters when Tanner Pearson scored his third goal of the playoffs on an empty net to extend the Kings lead to 5-2 with just over a minute left. Give the Kings credit again for frustrating the Hawks with their strong defensive play, crowding the middle of the ice and not allowing the Hawks to operate in open space. It was a defensive clinic by the Kings that I hope that hockey fans managed to pay attention to. Also, the Kings had a constant net presence in front of Corey Crawford throughout and it helped get them off to a dominant start. Outside of the two goals the Hawks’ just couldn’t counter and this is something that’s got to change if they want to keep their season alive. Special teams for the Kings has been tremendous in this series and Game 4 continued that trend. L.A.’s power play unit went 2-for-3 while its penalty kill unit blanked the Hawks in all their PP chances (3-3). The Kings also had the advantage in the categories of hits (33-30), blocked shots (23-12) and faceoff wins (33-24), each playing their role in dominating the pace of the game. Kings goalie Jonathan Quick had another stellar performance in stopping 22 of 24 shots, good for a save percentage of .917. On the other side, the Hawks’ Corey Crawford struggled once again, collecting 16 saves off 20 shots while only posting a .800 save percentage. This loss doesn’t belong to Corey alone — he and the Hawks’ defense are constantly being put at a disadvantage due to the inopportune penalties, plus the commanding net presence by the Kings in the opening period pretty much said it all for Crawford’s night. LA — Anze Kopitar and Justin Williams with two assists a piece. LA — That 70’s Line of Jeff Carter, Tyler Toffoli and Tanner Pearson combined for 3 points (1 goal, 2 assists). LA — Kyle Clifford lead the team in hits (5). LA — Drew Doughty lead the team in blocked shots (5). LA — Jarret Stoll lead the team with a 67 percent face-off percentage. CHI — Patrick Kane and Jonathan Toews with one assist each. 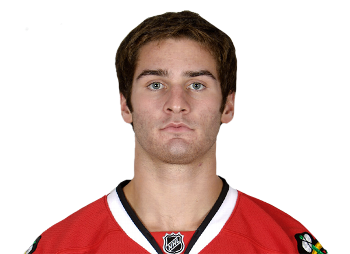 CHI — Niklas Hjalmarsson lead the team in blocked shots (5). CHI — Went 0-3 on the power play. CHI — Duncan Keith scored 0 points, and has clearly been outplayed in this series by his defenseman counterpart, Drew Doughty of the Kings. CHI — Patrick Sharp and Marian Hossa combined for 0 points. LA — Mike Richards scored 0 points (It was hard, but I had to find something for the Kings…). As I reminded you all after Game 3, if the Hawks should face a 3-1 deficit, it would be a difficult hole to climb out of and the Kings are a much superior opponent to the Detroit Red Wings from last year, who also had this team on the brink of elimination. Hawks players have been saying to the media that they would rely on their experience from the past, but they need more than experience to get past the Kings. First, the dumb penalties have to stop, they just do, they can not be a factor at all. Secondly, they have to be more consistent on the power play and actually convert one or two of those chances into points and third, they have to get more traffic in front of Jonathan Quick, an aspect of the offense that really has been non-existent since Game 1. Meanwhile, the Kings are a game away from eliminating the defending champs and conquering the demons from last year’s Western Conference Finals loss. This is actually a new position for the Kings in this year’s playoffs, actually leading a series. Previously the Kings have only led their series against San Jose and Anaheim after winning decisive Game 7s. L.A. trailed San Jose 0-3 and Anaheim 3-2, they have to look no further than themselves to know what a prideful, successful team can do with elimination hovering over them. The Hawks will not go down lightly and with a potential Game 7 in Chicago, the Kings would want to wrap up this series as soon as possible. Should the Hawks force a seventh game, they would clearly have the advantage, but not by much as the Kings wong their previous two rounds on the road. In all, though, it is still very early to look at any Game 7 scenarios, the Hawks certainly can’t afford to, all they can do is try to control the games in front of them, meaning all hands on deck for Game 5. The Kings have clearly outplayed the Hawks so far in this series and have made more big plays in crucial moments than the defending champs. It is as simple as this for Game 5 in Chicago, will the Hawks bring their focus and energy or their golf clubs in preparation for a longer-than-expected summer break? We’ll find out on Wednesday night.